I'm liveblogging from the European Conference on Information Literacy 2015 in Tallinn, Estonia. 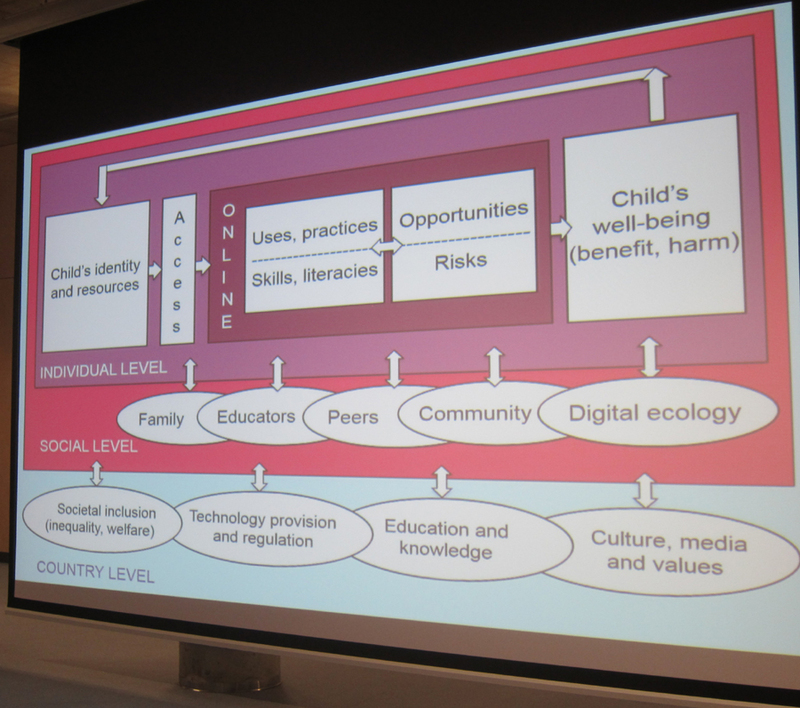 The first keynote is from Sonia Livingstone on Modelling Children’s Experiences of Online Skills, Opportunities and Risks: a European Perspective. She started by talking about the European Union-funded EU kids online network, which operated 2006-14 and ended by involving 33 countries. It carried out qualitative and quantitative research. This was funded by Safer/ Better Internet for Kids initiatives, and in 2015 the network passed to the Hans Bredow Institute for Media Research in Hamburg. Additionally there is a collaboration between the LSE (where Livingstone is based) and UNICEF: Global Kids Online. There is a lot of information on the linked websites, and I’ve blogged some of the reports previously as they came out. Livingstone highlighted how much media anxiety there is about children's use of the internet and online/social media. Indeed there is more focus on that, rather than on the benefits of online engagement. This had had implications for directions in which research and Government attention had gone, with questions urged about the potential harm of digital media. At the same time there was the equally problematic counternarrative about digital natives, which also inhibited focus on developing children's literacies. Therefore the projects that Livingstone had been involved with were aiming to address these problematic narratives. She highlighted the extent to which access and use of information is changing fast, and the need to investigate the children's perspective. Whilst on the one hand children may be very comfortable with using their devices, they still have anxieties and find some material (e.g. about violence to people and animals) upsetting. Livingstone said that a survey of a thousand children (and parents) in 25 countries was the one of the most challenging things they did. It shows (and she said, most surveys of this kind show) that the risks that adults worry about (e.g. seeing sexual content and being bullied) affect a minority (e.g. 12% in 2014). Overall, in 2014 17% say they had been bothered by something on the internet in the past year. Notably, some of the things that worry adults were not worrying the children. However, more concerning is that between 2010 and 2014 there was more of an increase oin girls being bothered. Livingstone moved on to talk about "skills and literacies". The Kids Online project had asked chilldren what they had done online. Comparing 2010 and 2014, basically the children do more of everything. 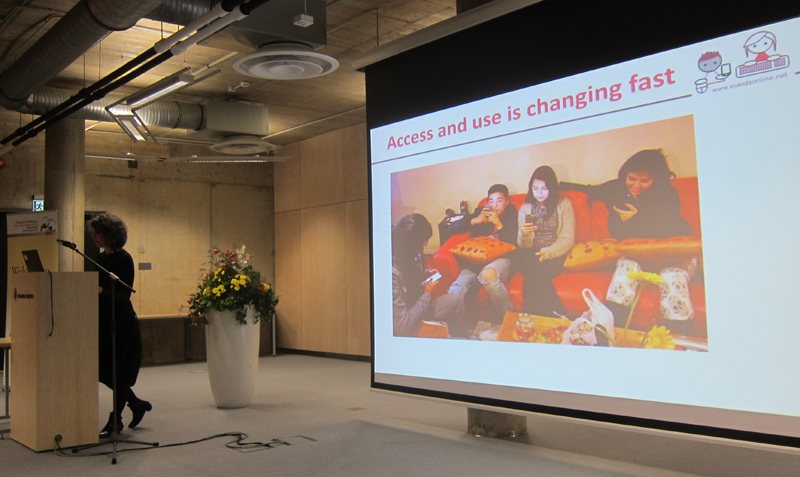 The top 3 activities were visiting social networking profiles, using instant messaging and watching video clips. Using the internet for school work followed on from that. (n.b. this information can all be found in more detail on the websites I've linked to). Moving on to skills about privacy and evaluation; for example (in 2014, 11-16 year olds) 71% could block messages, whilst at the other end of the scale 37% knew how to change their filter preferences (e.g. on search engines). 57% said they could compare information to find out if it were true. Livingstone showed there was a correlation between doing a lot on the internet and having these skills, although their were variations by country. There were also correlations between a high level of activity and the number of risks encountered. Obviously there are hopes that developing skills in information/media/digital literacy could help counter the risks. What is unclear is which factors make some countries apparently less risky (ie with a lower correlation between high level of activity and experiencing more risks). This was the outcome of an observational study with 70 families. Parents and siblings interaction and involvement with young children was important. Livingstone finished by talking about the challenges of impact, in particular impact on policy, as well as achieving change. Sometimes the push for education to simplify and make measurable, and the service/application designers' complication of privacy setttings etc do not help. She left us thinking about digital Barbie, and the issues around the information which children are giving their digital Barbies, and what might happen to it (this draws in issues of surveillance, by companies, parents and governments, the subject of some questions after the talk).